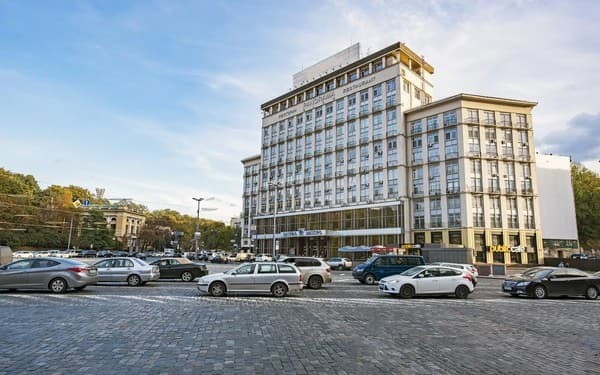 Hotel "Dnipro" is located in the heart of Kiev, at the intersection of Kreshchatik and European Square, 200 meters from Independence Square. It offers 186 comfortable rooms of different categories with views of the slopes of the Dnieper River, the streets of the old and modern Kiev. Each room is decorated in a modern design style and is equipped with comfortable furniture. The Dnipro Hotel provides a wide range of services for business and leisure travelers: a restaurant, a bar, a nightclub, and conference rooms. To maintain excellent shape and well-being, it is proposed to use the swimming pool, Finnish sauna, gym, spa salon and massage rooms. The hotel has 2 restaurants ("Panorama Club" and "Dnipro"), lobby bar "European" and bar "Munich". 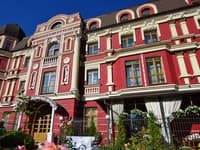 Hotel "Dnipro" is located 3.6 km from the central railway station, 6 km from the bus station, 35.7 km from the airport "Borispol", 9 km from the airport. 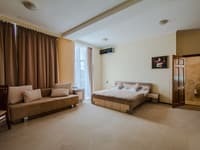 Description of the room: The best variant of economical and comfortable living in the business and cultural center of Kiev. The most suitable option for those who are in the capital of Ukraine on a business trip or business trip. For a pleasant stay and productive work, modern communications facilities, an ergonomic work area, a comfortable one and a half bed and a bathroom with a shower cabin are at guests disposal. 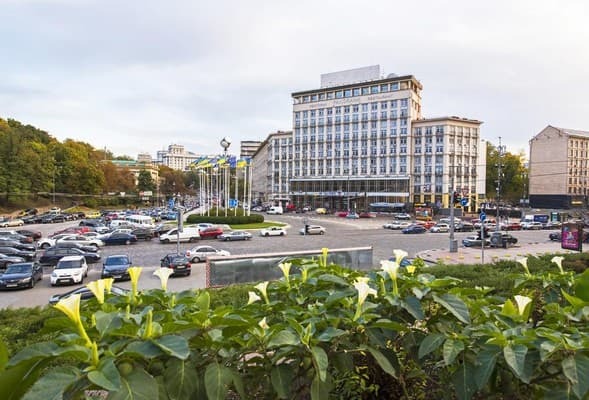 From the window you can see the historical part of Kiev or the inner courtyard of the hotel. Description of the room: Comfortable and homely cozy rooms, decorated in a classic style and warm colors, equipped with everything necessary for a pleasant stay and productive work. The room has a semi-double bed and a bathroom with a shower. At the service of visitors all the necessary means of communication. 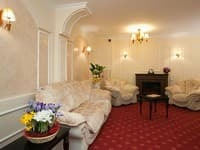 Comfort for reasonable money is an ideal option for a tourist or business trip to the capital of Ukraine. Most rooms in this category have a view of the inner courtyard of the hotel or the historical center of the capital. Description of the room: Comfortable rooms of this class have everything you need for a quiet rest and work. Classic interior, mini-bar in the room, bathroom with bath. The room has two single beds. 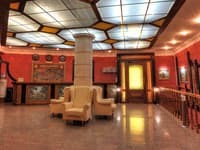 Description of the room: Two-room rooms with a wonderful view of the historic center of Kiev. Simplicity and restraint of the classical interior, light wood combined with warm beige tones, a living room and a bedroom with a large double bed and comfortable soft armchairs create a pleasant atmosphere of home comfort. This room type has a spacious bathroom with a bathtub. Description of the room: Guests are invited to enjoy the wonderful panoramic view of Kiev from luxurious and spacious suites. Two-room suite with living room and bedroom, heavy velvet and carved furniture looks impressive in its beauty and absolutely harmonious. These are chic rooms for those who are supposed to choose the best from the best by status. The room has a double bed and a magnificent spacious bathroom. All children under 5 years stay free of charge for cots. 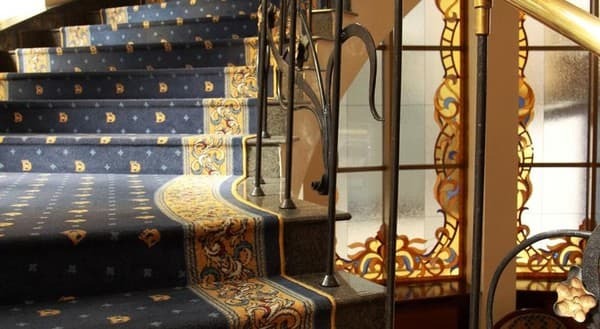 Dnipro Hotel is one of the best hotels in Ukraine, which has more than 50-year history of creation hospitality. A professional team makes a success story with you and works every day for your comfort and cosiness. 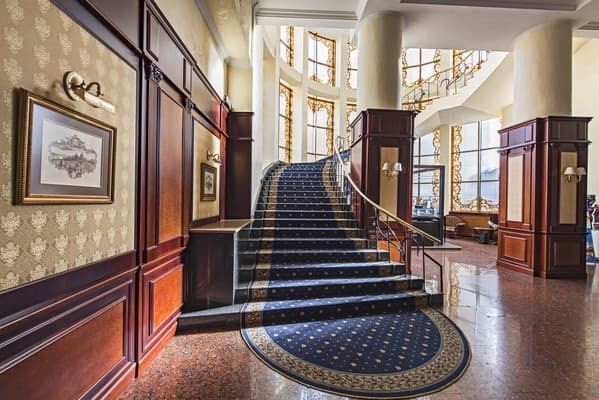 Located in the heart of historical and business part of Kyiv, the Dnipro Hotel successfully combines a classic atmosphere of cosiness and comfort with all the necessary for a business person. 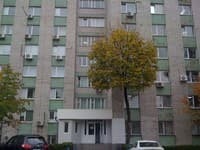 Great location near the park fills you with fresh air, beautiful view of the Dnipro river gives you confidence and space, comfortable rooms give you peace and relaxation, and the team of cooks will always make something delicious and exquisite for you. We are living and working for your comfort! Welcome to the Dnipro Hotel! Be our guest!